In Vault 2012, the shares feature has finally been removed. We've been slowly deprecating it over the past few releases, but now it's final. A new feature, links, has been added as a replacement feature. In case you are not familiar with shares, it was a feature that allowed a file to live equally in multiple folders. This was a big pain to deal with in code because you couldn't assume that a file had a single location. In Vault 2012, you don't have to worry any more. A file lives in one and only one folder, always. The new feature, links, is an object that points to a file in another location. It's very similar to Windows shortcuts. So even though a file has only one true location, there can be many links to it that live in other folders. Files are not the only thing you can link to either. Folders, items and change orders can have links too. So you can use it to organize your items into folders or crate project folders containing all the relevant objects. When you migrate to Vault 2012 from a previous release, any existing shares get converted to links. The oldest folder location is chosen as the true location of the file. Any other folder locations become links to the file. Links can only be created in Vault Workgroup and above, but because of legacy data, it may be possible for links to show up in the basic version of Vault. At the API level, the code is still structured around shares. For example, GetFoldersByFileMasterId returns an array of Folders even though the array will always have 1 element in 2012. And DeleteFileFromFolder has you pass in a folder ID even though there is no reason to. The API functions that deal with Links are pretty straightforward. DocumentService.AddLink() adds the link. DocumentService.GetLinksByFolderIds() gets the links for a given set of folders. DocumentService.FindLinksBySearchConditions() is especially cool because it allows you to search for links. Technically, the property conditions are searching on the thing that the link points to, but the results are in link form. However, any folder information passed in will be applied to the link locations, not the original file locations. There are some creative uses for this feature. For example, you can search for all items within a folder. I knew this was going be a problem one day. I have a bunch of awesome apps that need to be updated to the latest version of Vault, but I don't have enough time to update them all. I'm open to suggestions on how to fix this problem. Let me start by listing all the samples that won't work with Vault 2012 and which ones I plan on updating. App name Plans to Upgrade? Recycle Bin No. Too many technical issues. Set Revision iProperties No. I think the new Revision Block feature makes it obsolete. Keep in mind I don't know when I'll be upgrading any of these apps. Sometime before the next Vault release is as specific as I can get right now. One of the main reasons that I posted the source code to all the apps is so that I wouldn't be solely responsible for things like bug fixes, new features and upgrades. I'm perfectly fine with other people making the needed updates. Remove all the Autodesk copyright/legal stuff. Replace with your own copyright/legal stuff if you want. Tell me where you posted the app, and I'll link to it from this blog. The app itself, will not be hosted here. The basic idea is that when you update the app, it becomes yours, not mine. A couple of people suggested using online development sites like SourceForge or CodePlex. Those sites are fine, but I don't want to be the one managing it. If I did, that would be yet one more site that I would be running, and I don't have the time. Feel free to set up a site on your own, and I will be happy to link to it. I just don't want to run the site. Submitting an updated project to me also won't work. I don't have time to review other people's changes. In many ways, reviewing code takes longer than just doing the update myself. At least when I write the update, I know exactly what changed. If you have any other suggestions, let me know in the comments section below. The service manager concept has been around for a while. Almost every SDK and blog sample has one. 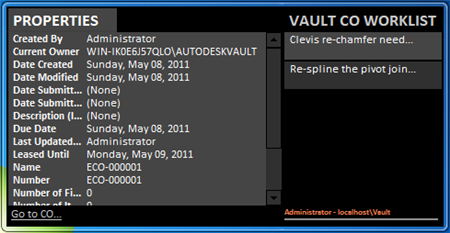 For Vault 2012, we decided to build it into the API. It's a bit tricky to get used to at first. But once you get the hang of it, you'll love it. Login management - It will handle the login and logout for you so you don't have to. Service creation - The WebServiceManager is a factory, so it will create all your services for you. You don't have to worry about calling new, setting the URL or copying security headers. Re-SignIn - If you run into error 300, which means your login has been invalidated, the WebServiceManager will automatically catch the error, sign-in again, re-run the command, and return the new result. This feature is only available if you use a credentials class that supports sign in. The WebServiceManager can be found in Autodesk.Connectivity.WebServicesTools.dll. As the name implies, it contains tools to help you use the web services. Currently, the WebServiceManager is the main component of the DLL. To create a WebServiceManager, you need to provide it with credentials, which tells the manager how to log in and log out of Vault. There are several credentials classes available, so you need to use the appropriate one. It usually is based on the information you have available. For example, if you have the username and password, you would use the UserPasswordCredentials. If you are in a custom command, and a context is passed in, you can use the UserIdTicketCredentials. NOTE: There are some known issues with UserIdTicketCredentials and WebServiceCredentials, so read this article first before using. Once you have created your WebServiceManager, you are ready to start making web service calls. It has properties for each service and each service has its full set of functions. To sign out, just let WebServiceManager go out of scope. It's an IDisposable class, which means it does special things before it gets garbage collected. So that's where all the sign out happens if a sign out is needed. I recommend declaring the WebServiceManager in a using statement if possible. That way you know when Dispose() will get called. If it doesn't make sense to have a using statement, I recommend explicitly calling Dispose() when you are done with it. In effect, the Dispose() replaces SignOut(). Since the WebServiceManager references every service, which in turn references every server function, the WebServiceManager is the web services API. You can just use a single object to make every Vault server call. Here is a comparison of the old way versus the new way with the WebServiceManager. There are a couple of issues that have already been found with the latest SDK. I want to make sure everyone knows about them upfront. Please avoid using UserIdTicketCredentials and WebServiceCredentials in Autodesk.Connectivity.WebServicesTools.dll. We found an issue where they log out of Vault incorrectly in certain cases. If you don't know what these classes are, it's because they are new in Vault 2012. The classes are used to provide login information to the new WebServiceManager class. Workaround: The links below contain fixed versions of the classes. Basically the logout capability has been disabled so there is no danger for accidental logout. To use, just add the .cs or .vb to your project and use the UserIdTicketCredentials_bugfix or WebServiceCredentials_bugfix classes in place of the normal classes. I had this fixed. I swear. Unfortunately, something happened between my fix and the final release. So when you deploy new Vault Explorer commands, you will need to reset the menus before you can see it in the menu bar. The good news is that toolbars don't need a reset and menus are much more stable than they were in Vault 2011. You should no longer see cases where the entire menu bar gets jumbled because a custom command was deployed or removed. Workaround: Do a menu reset after deploying a custom command. The reset command can be found manually by right clicking on the menu bar and running the Customize command. Programmatically, a reset can be done by deleting the menu.xml file in %AppData%\Autodesk\[Vault Product]\Objects\Menu.xml. It's the same as the Vault 2011 workaround. The worklist feature in Vault Professional is a nice feature. It pops up information informing you of any change orders you need to take action on. The only problem is that you need to launch the Vault Professional client to get that feature. 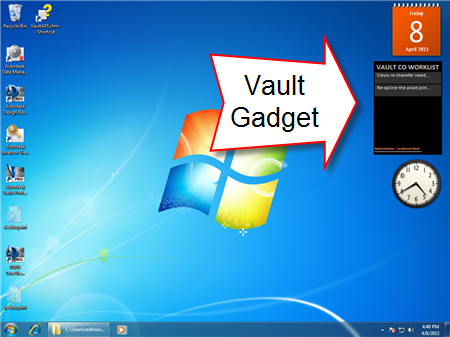 Chris Sawicki and Brian Schanen decided to change that with Vault Gadget. 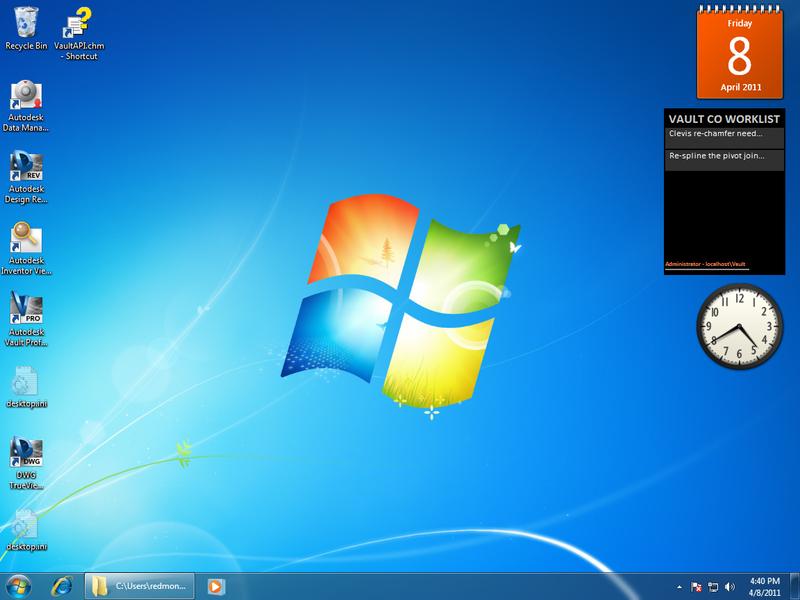 Vault Gadget allows you to view your worklist from your Windows desktop, without the need to run Vault Professional. Extract the contents of the ZIP file to “%localappdata%\Microsoft\Windows Sidebar\Gadgets”. The result of this step is a folder named VaultCO.Gadget in the “%localappdata%\Microsoft\Windows Sidebar\Gadgets” folder. Right-click on the desktop and select the “Gadgets” menu item. The Gadget Gallery will be displayed. Find the “Vault CO Worklist” gadget (you may have to page through the gallery to find it). Click on the gadget and drag it onto your desktop. The gadget will appear on the desktop and error information will be displayed. Enter in your Vault connection settings. See the change orders in your worklist without running Vault Professional. Refresh timer - adjust how often Vault Gadget checks for worklist items. Click on a change order to view the properties. Click on the "Go To CO" link to launch Vault Professional and navigate to the Change Order. 4 weeks have passed and, as promised, 4 apps have been posted. Special thanks to all the members of the Vault team that submitted apps. We now return you to your regular Vault API blog. What is the Event feature in the Vault 2012 API? For Vault 2012, we added a feature called Web Service Command Events, which allows you to run custom code before and after certain Vault operations are executed. For example, you can perform custom operations after a file gets checked-in. What is the scope of my event handlers? Your handlers will hook to any application on that computer using Autodesk.Connectivity.WebServices.dll. Starting in Vault 2012 all Autodesk Vault clients use this DLL for communication with the server. So you can hook to applications like Vault Explorer, AutoCAD, Inventor, Civil 3D, and so on. Let me restate, that this feature runs client side. So if you have 100 Vault users, your event code needs to be deployed to 100 computers in order to grab all events. What Vault products does this feature work with? Vault Workgroup, Vault Collaboration and Vault Professional. It is not available in base Vault. What operations can I receive events for? In addition to the ones listed in the grid, you can receive events for File Download, Item Rollback Lifecycle, and Item Promote. What are the events I can hook to for a given operation? GetRestrictions - This part allows event handlers to block the operation. Pre - This part allows event handlers to run code before the operation takes place. Post - This part allows event handlers to run code after the operation has finished. When and where do these events fire? If restrictions are found during the GetRestrictioins phase, the operation is blocked and never continues to the Pre. If there are no restrictions, things continue to the Pre. Unless something unexpected occurs, Pre, Web Service call and Post should always execute. As you can see, the events happen around the web service call. In other words, at the layer where the client communicates with the server. Keep in mind these events may or may not correlate with the UI command that the user invokes. For example, a user performs a Get command on a file in Vault Explorer. This may trigger multiple download events if an entire assembly needs to be download. Or it may trigger no events if the file on disk is up-to-date. What can I do in an event handler? Inside a GetRestrictions event you can block the operation and provide the reason for the restriction. Inside a Pre and a Post event you run extra operations, such as sending off an email or queuing up a Job. What can't I do in an event handler? You can't change the parameters to or from the operation. You can see most of the parameters passed in, but you can't change them. Likewise you see the return result, but you can't alter it. For example, in the Pre AddFile event you can see that the file name parameter is "Part1.dwg", your code cannot change that name to "ZX-0389.dwg". You should also avoid UI in an event handler. You don't know what context your handler is running in. For example, you could be running in a command line utility or a service. Bubbling up exceptions is not a good idea. Again, you don't know the context you are running in, so an exception might end up shutting down the parent application. The safest thing is to wrap each event handler in a try/catch block. Lastly, make sure you don't create and infinite recursion of events. For example, during a Pre AddFile event, your code adds a file, which triggers an AddFile event, which causes your code to add a file, and so on. Even if your code works fine on its own, remember that there might be other event handlers loaded. So your handler might run and operation that triggers another handler, which runs an operation that triggers back to your handler, and so on ad infinitum. If the Vault server throws an error do I get a Post event? Yes, and you can see the Exception that is thrown. Am I guaranteed a Post event? Not in all cases. It's technically possible for the operation to complete on the server, but your computer loses power right before the Post event. However during normal operation, yes, you will always get a Post event. Is there anyway to enforce that an Event fires? No. If the computer doesn't have your handler installed, or your hander fails to load for some reason, the operation will go through without hitting your code. How do I write an event handler? A detailed list of steps can be found in the Getting Started section of the API documentation. The RestrictOperations sample in the SDK has sample code. I wrote a Vault client, will event handlers be hooking to my application? If you use Autodesk.Connectivity.WebServices.dll to communicate with the Vault Server, yes. So your code should handle cases where operations are blocked by other event handlers. In your app, these restrictions will bubble up as an Exception of type Autodesk.Connectivity.Extensibility.Framework.ExtensionException. Are my handlers specific to a version of Vault? Yes. For example, your Vault 2012 extension can handle events from the Vault 2012 version of Autodesk.Connectivity.WebServices.dll, but not from any other version of the DLL. Which Web Service functions fire which events? You can see the full mapping in the Web Service Command Event Mappings of the Knowledge Base in the Vault SDK documentation. There are no cases where a web service function fires multiple events. Are there other event types? Yes, but I'll cover those in another post. Keeping with the theme of visualizing things that are not visual by default, I present to you Show Revision Diagram. Showching Tong and Alan Zang created this app to help illustrate the revision concept. Just download the app and run the install. 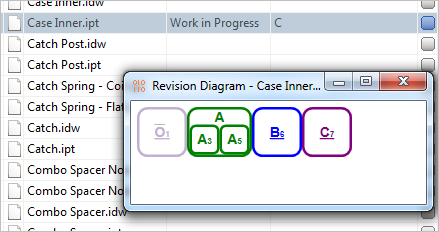 Right click-on a file and run the Show Revision Diagram command. A dialog will pop-up showing the revision history for that file. The large character represents the revision iteration. The small number to the right is the version number that represents the revision. If the text is underlined, then the revision is currently not a released state. A revision that has been re-released (most likely through a quick change processes) will display a large box with smaller boxes inside. The larger box represents the main revision. The smaller boxes show the multiple version that represent each released version of the revision. An O with a bar over it represents a null revision or the absence of a revision. This is treated in the same manner as an actual revision. The color of the boxes has no meaning. Hover your mouse over a box to see its lifecycle state. Check back next week for the final app in the series. It's like the Plugin of the Month page times 4. Here is a quick video I put together showing you the layout of the new SDK. I also do a demo of the RestrictOperations SDK sample, which illustrates the new event feature in the API.